The execution by firing squad in 1757 of Admiral George Byng (1704-1757) on the quarterdeck of HMS Monarch in 1757 is perhaps best remembered by Voltaire’s verdict in his novel Candide: “In this country, it is good to kill an admiral from time to time, in order to encourage the others.” Byng had been court-martialled for failure to relieve the besieged British garrison in Minorca in the Western Mediterranean the previous year. The key element in the charge was that he “had not done his utmost against the enemy in battle or pursuit”, as required by the “Articles of War” that governed the Royal Navy. A death sentence was mandatory for conviction on this charge. Byng’s squadron was seriously undermanned and ill-prepared for the latest conflict with France – later to be known as the Seven Years War. One of the French opening moves was to land 15,000 men on the island and lay siege to the British base there. 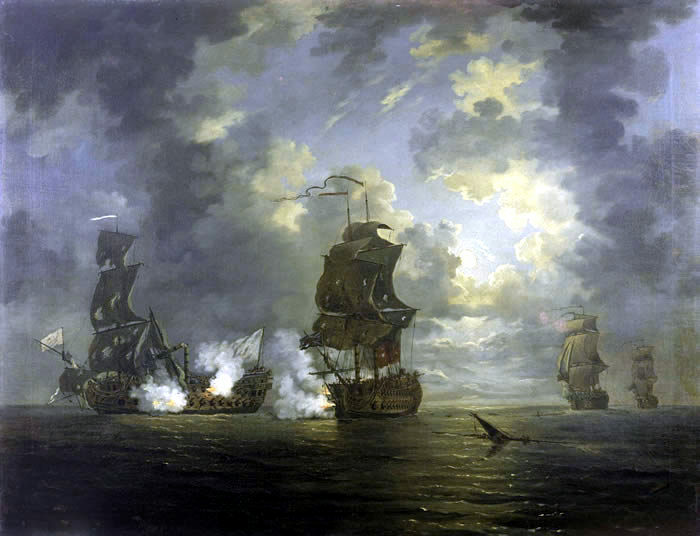 Byng’s force, sent to succour the besieged garrison, did indeed engage the enemy in the inconclusive naval Battle of Minorca in May 1756 and, following a council with his senior officers thereafter, he decided that Minorca was beyond saving from the French. 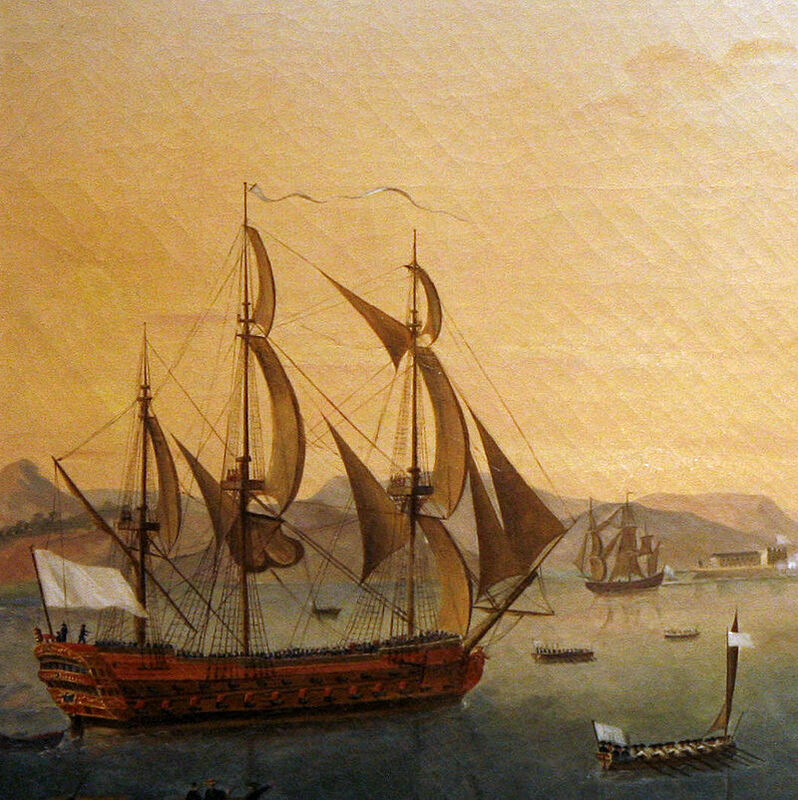 Byng brought his ships back to Gibraltar for refitting and the Minorca garrison was obliged to surrender to the French, thereby depriving Britain of a vital strategic resource. Recalled to Britain, Byng’s disgrace, court-martial and execution followed. Though the full responsibility for the disaster had been laid on Byng, a degree of opprobrium also attached itself to his captains. Among these was Captain Arthur Gardiner, who had been Byng’s flag-captain, an honourable man who felt that his own honour had been compromised. 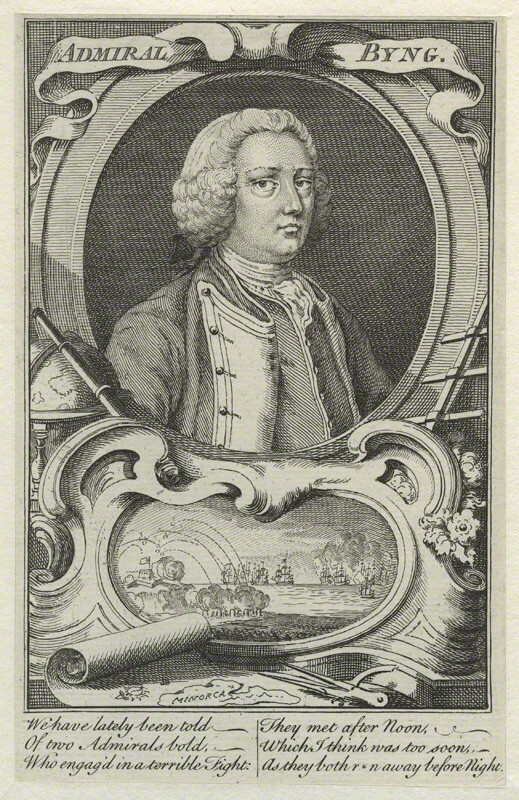 He appears to have been especially hurt by a remark by the First Lord of the Admiralty, the formidable Lord Anson, which he reported to his friends and was to the effect that “he was one of the men who had brought disgrace on the nation.” For a man like Gardiner it was essential to demonstrate, at whatever cost to himself, that he was not the man Anson had judged him to be. Soon after Byng’s death Gardiner was sent back to the Mediterranean in command of the 64-gun HMS Monmouth, as part of Admiral Henry Osborne’s squadron. In early 1758 this force had succeeded in driving a French fleet of fifteen ships into the Spanish port of Cartagena and keeping them blockaded there. This fleet had been en-route to Louisbourg, the great French fortress on Cape Breton Island, with reinforcements. On February 28th a French relieving force of three ships-of- the-line, carrying the Governor of “New France” (French Canada) and under the naval command of Admiral Gallifoniere. This officer also spotted the British force, and realising that it was larger, decided to retreat. Osborne responded by ordering a general chase, directing Gardiner in Monmouth, and two other ships, the Hampton Court and the Swiftsure, to engage Gallifoniere’s flagship, the Foudroyant. The latter was one of the most powerful vessels afloat, her eighty guns consisting of thirty 42-pounders – enormous weapons for the time – as well as thirty-two 24-pounders and eighteen 12-pounders. 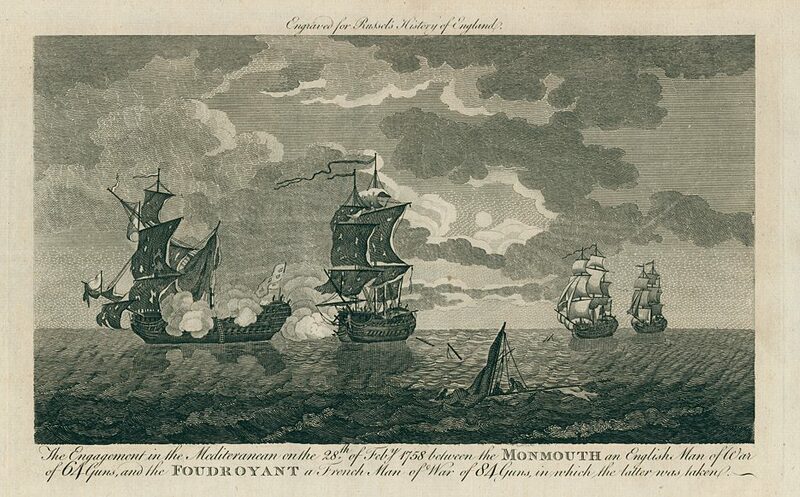 With a crew of 470, a French privateer previously captured by the Monmouth had said of the Foudroyant that “She would fight today, tomorrow, and the next day, but could never be taken.” By contrast, the Monmouth was armed with sixty-four 24-pounders and had a crew of 470 and her two consorts were almost identically armed. Together, these three ships might have been enough to defeat the more powerful French vessel, but any one of them alone would be heavily outgunned. Captain Gardiner died the following day but his aspiration to have Foudroyant brought into Gibraltar was realised. Lieutenant Carkett was appointed to command her “as a reward for his conduct and an encouragement for future emulation” and was further rewarded by promotion to post captain, the coveted goal of every ambitious officer. It was especially valuable as he had originally entered the navy as a common seaman and had risen by his own exertions. This was however his last promotion and he was still a captain in 1780 when he was accused – unfairly – of failure to obey signals during the Battle of Martinique. Tragically, he did not live to clear his name as his ship, the Stirling Castle, was wrecked in a hurricane There was only a handful of survivors and Carkett was not among them. The “butcher’s bill“ for the Monmouth vs. Foudroyant action was decidedly one-sided, reflecting Monmouth’s ability to retain manoeuvrability while her opponent was immobilised. She suffered 27 killed and 79 wounded (a not-inconsiderable loss rate of 23%) while the more powerful Foudroyant had 190 killed and wounded (40%). Gardiner’s grim determination to ignore the disparity in armament had paid off, though it cost him his own life. It is probable that he found the price an acceptable one for redemption of his name and honour.